Hillary Rodham Clinton won the presidential endorsement of the American Federation of State, County and Municipal Employees on Wednesday, an important boost for the Democratic front-runner. The union is the largest for workers in the public service sector with 1.4 million members nationwide. AFSCME represents government and private workers including nurses, bus drivers, child care providers, custodians and librarians. The New York senator will officially accept the endorsement later Wednesday. 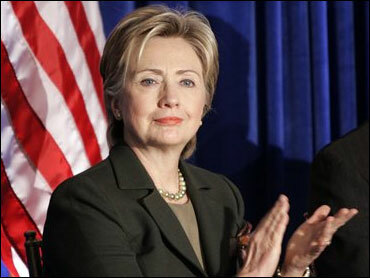 "I am honored to receive the support of AFSCME," Clinton said in a statement. "In my administration, America's working families will again have a partner in the White House." Gerald McEntee, president of the union, said Clinton "will help rebuild America's middle class and make sure everyone shares in our country's prosperity." The endorsement is a welcome boost for Clinton in the labor community. The 1.8-million member Service Employees International Union decided not to endorse a candidate on the national level, and SEIU's state chapters have been backing Clinton rivals John Edwards, whose pickups included the New Hampshire chapter on Wednesday, and Barack Obama. AFSCME is expected to provide help in early-voting states, such as Iowa, where it has about 30,000 members, and New Hampshire, where it has about 3,000. AFSCME budgeted about $48 million for get-out-the-vote efforts in the 2004 election. The union endorsed former Vermont Gov. Howard Dean for the Democratic presidential nomination in 2004. Dean lost steam after a disappointing performance in Iowa, and Massachusetts Sen. John Kerry went on to win the nomination. Union endorsements can be key in a primary campaign, not only for the money and publicity a union can provide but for the manpower it can throw behind a candidate in the form of workers to man phone banks and hand out leaflets. "All of the candidates on the Democratic side of the ticket, they're all speaking our language," McEntee told The Associated Press this summer when asked about the presidential contenders. McEntee has long made overhaul of the nation's health care system a priority for the union. President Clinton named McEntee to serve on the Presidential Advisory Commission on Quality and Consumer Protection in the Health Care Industry in 1997. Other unions that have endorsed Clinton include the United Transportation Union and the International Association of Machinists and Aerospace Workers, both in August. The AFL-CIO and its unions said in September they will spend an estimated $200 million on the 2008 elections, with the nation's largest labor federation devoting a record $53 million to grass-roots mobilization. Former North Carolina Sen. Edwards has been endorsed by the United Brotherhood of Carpenters and Joiners, the United Steelworkers of America, the United Mine Workers of America and the Transport Workers Union, as well as about a dozen state chapters of the Service Employees International Union. Illinois Sen. Obama has been endorsed by the Correction Officers' Benevolent Association, as well as the Illinois and Indiana chapters of the service employees union. Clinton also has been endorsed by the Transportation Communication Union, National Association of Letter Carriers and the International Union of Bricklayers and Allied Craftworkers in September. Sen. Chris Dodd of Connecticut was endorsed by the International Association of Fire Fighters in August. The union's endorsement played a significant role in boosting Kerry's successful bid for the Democratic nomination in 2004.